Designers Anna Citelli and Raoul Bretzel have created Capsula Mundi, an egg-shaped pod for the deceased that offers an alternative to traditional burial methods. The body of the deceased is placed in a foetal position inside a container made from biodegradable material before the pod is buried in the earth. A tree, chosen either by the deceased prior to their death or by the family is then planted above the burial site. Capsula Mundi is presented at the Broken Nature exhibition at the XXII Triennale di Milano, which is curated by Paola Antonelli and takes place between 1 March and 1 September 2019. The exhibition seeks to explore the badly severed ties between humans and nature, and the fact that we will inevitably become extinct. "In a culture that is far removed from nature, overloaded with objects, and focused on youth, death is often dealt with as a taboo," said Citelli and Bretzel. "The biological life cycle and its transformations are the same for every living being. It is time for humans to realise our integrated part in nature," they explained. "Capsula Mundi wants to emphasise that we are a part of nature's cycle of transformation." By planting a tree which is fertilised by the decomposing pod, the designers want to "change our approach to death" and provide a sustainable alternative to traditional burial methods, which can be damaging to the environment. "A tree takes between 10 and 40 years to reach maturity so using a wooden coffin has a strong environmental impact," they explained. "We want to plant trees instead of cutting them down." "The cemetery as a forest not only will reduce the environmental and landscape impact but also it will give new green spaces to our planet," they said. Once planted, the tree is secured with a GPS tracker so that relatives of the deceased person can find the tree with ease. 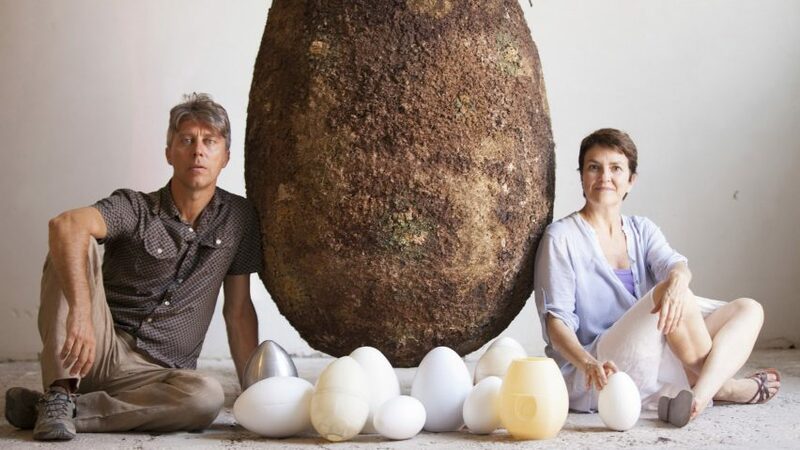 The pair have also designed an egg-shaped urn made of bioplastic to contain the ashes of those who choose to be cremated. The ashes are fed through a hole and secured with a cone-shaped screw top. Similar to the full-body pod, the urn is planted in the soil and a tree is planted on top of it. According to the designers, the time it takes for the urn to biodegrade ranges from a few months to a few years, depending on the soil conditions. "Capsula Mundi doesn't have any religious implication and the project has been understood and accepted by people from all over the world, from different cultures and faiths," said the designers. In a similar bid to make death more sustainable, Shaina Garfield created an eco-friendly coffin that uses fungus to biodegrade the body so that it decomposes quickly and fertilises the surrounding soil.